The portion of buyers willing to bid on their future home sight-unseen just keeps rising. Thirty-five percent of people who bought a home last year made an offer on a home at some point during their search without seeing the house in person first, according to a study commissioned by Redfin. Thirty-three percent said the same last May and 19 percent before that in June 2016. “With no end to the housing shortage in view and more millennials entering the housing market, the trend toward sight-unseen bids is likely to grow in 2018,” Redfin said in a press release. 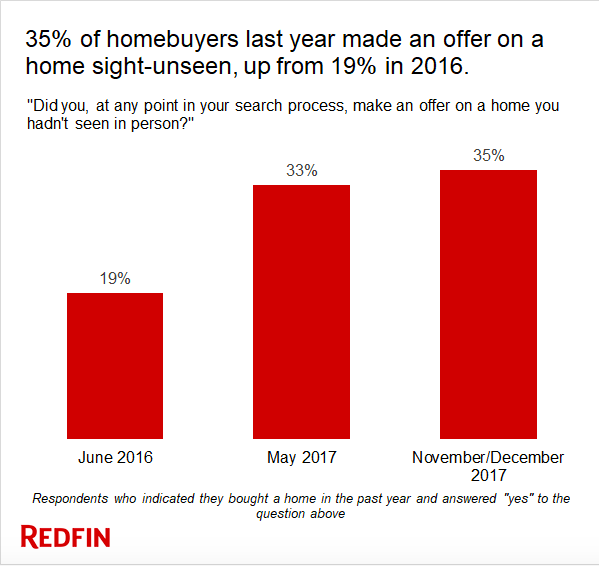 Redfin, a tech-reliant, low-fee brokerage, in November and December commissioned the survey of 1,503 people who had bought or sold a home in the last year, tried to buy or sell in the last year or are planning to buy or sell in the year ahead. Buyers’ willingness to make an offer without walking through a house, in some cases, speaks to the availability of 3-D tours and other technology that gives buyers a better picture of a house from afar, such as virtual reality. Redfin, in its announcement, emphasized the use of its own Redfin 3-D Walkthrough tool and regular, iPhone FaceTime. But in other cases, sight-unseen purchases are just investment properties. Los Angeles topped the list of metro areas with the highest proportion of sight-unseen purchases — a huge 57 percent. Many of those offers likely came from foreign buyers and investors. In terms of non-investment purchases, millennials are more likely to make an offer on a house relying only on digital tools. Forty-five percent of millennial respondents to this survey told Redfin they had made an offer on a home without seeing it in person. Only 6 percent of baby boomers said the same. Buyers who bid on a home without seeing it don’t necessarily close the transaction without stopping by in person, however. And it’s possible the survey may exaggerate the tendency of the average U.S. homebuyer to make offers sight-unseen, as most metro areas the survey looked at were among the most competitive markets in the country. The change from respondents last May is small, but noteworthy. This round of survey results showed a small but steady uptick from seven months earlier in buyers’ willingness to make the first step toward a new home relying on technology, yet Redfin also noted the importance of real estate agents in facilitating a sight-unseen bid.